If you love classic fruit machines, you’ll be in seventh heaven with Cherry 7 mobile slots by mFortune Casino. Complete with 3 reels and 5 win lines, this game may be small but it sure is mighty. Won’t you take a bite? You’ll soon see how sweet it tastes. Cherry 7 is our first mobile slots game where you can spin the reels in both landscape and portrait mode, with the traditional one-armed-bandit machine taking centre-stage in a reel-dominated design. Will you squeeze out the juicy Jackpot? Play today and find out! Cherry 7 is compatible with Android 5 and iOS 10 operating systems. You can also play it online on your desktop or laptop. Ready to pop your cherry? Getting started playing Cherry 7 is simple! As the game is fixed to 5 win lines, the only parameter you need to set is your bet-per-line. Tap the ‘Bet’ button and then press the ‘+’ and ‘-‘ buttons to set your bet-per-line. While you do this, you’ll notice that the number in the ‘Total Bet’ box increases or decreases accordingly. This amount is your total cost-per-spin and is worked out by multiplying your bet-per-line by the number of active win lines in play – which is always 5 in Cherry 7. For example, if you bet £1 per line across 5 win lines, your total bet would be £5 per spin, and so on. 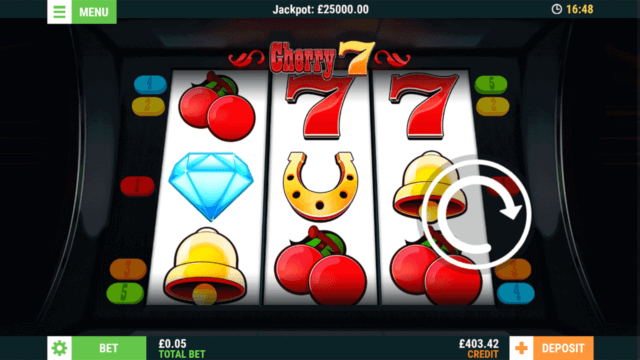 In Cherry 7 mobile slots, you can bet anything from 4p up to £20 a line. All set to go and happy with your chosen bet? Cherry good! Let’s get started then, shall we? All that’s left to do is tap the floating wheel to start the reels which will spin in before coming to a stop at random. Any winning lines will be highlighted on screen with the win amount displayed, before we add it automatically to your total credit. Like the classic one-armed-bandits that inspired this game, the win lines in Cherry 7 pay from left to right. As this mobile slots game can be played in both portrait and landscape, flip your device to try it out! Cherry 7 could prove to be a pretty fruitful mobile slots game for you! Not only can you win by lining up three of the same symbol, you can win by matching a mix of them too! You can bag a juicy win by lining up three 7s of any colour, three golden symbols or three red and gold cherry symbols. Pretty sweet, right? When you line up a winning symbol combination, you’ll be awarded a multiplier of your original bet-per-line. Exactly what that multiplier is will depend on the combination of symbols rolled in, so check out the in-game paytable for full details. Here’s where things get even juicier. If you win across multiple win lines with a single spin, all your reel wins will be combined before they get added to your total credit. We hope this doesn’t turn things too sour, but only the highest win on a single line will be paid. We’ve got the classic 7s, the golden cherry, and the Jackpot symbol, but one symbol you’ll want to keep an eye out for it the Wild symbol. Wilds can substitute for any of the other symbols in Cherry 7 and help turn a losing spin into a winning one. For instance, line up a Wild alongside two cherries to be awarded the multiplier you would have grabbed lining up three cherries in the first place. While we need to tell you that you can’t win this game’s progressive Jackpot where a Wild replaces a Jackpot – you need 3 Jackpot symbols to do that! – you can still bag a pretty tangy multiplier of your original bet-per-line. Cherry 7 is a mobile slots game you’ll be desperate to sink your teeth into! This modern take on the classic fruit machine certainly won’t leave you with a bad taste in your mouth. So what are you waiting for? Play Cherry 7 today and see what ripe riches await you! Not currently signed up to mFortune? Now’s the best time to join! Register for your first and only account today, and you’ll grab a no deposit welcome bonus of £5*. Plus, when you eventually make your first deposit, we’ll match it 100% up to £100**. Sign up today! *18+. £5 welcome bonus to new players only. No deposit required. Full T&Cs apply. **18+. New players only. 100% deposit match of first deposit, up to £100 awarded as bonus credit. Bonus credit is not withdrawable. Full T&Cs apply. The occurrence of 3 (three) “JACKPOT” symbols on an active win line awards a progressive Jackpot. The progressive Jackpot is available on any bet, with 0.005% of the bet being added to the progressive pot. There is no hidden reserve pot. When the Jackpot is won, it is reset and begins to rise again. Simultaneous wins can occur, if another player wins the progressive Jackpot then a notification to this effect would occur BEFORE the current player was awarded the Jackpot. The game Jackpot seed value is £25,000. The Jackpot is individual for this game, it is not shared with any other games. In the event of a communication error after a progressive win result has been determined and before it has been displayed on screen, the win amount will automatically be transferred to the player’s account. While the game is live, the Jackpots cannot be terminated. Cherry 7 mobile slots has a theoretical return to player of 94.6%. This is based on long term playback. System malfunctions void all payments. Monies are staked in the following order: winnings, player deposits, bonus credit. mFortune general terms and conditions apply.